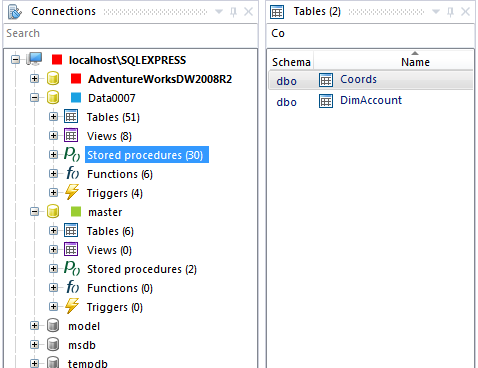 Attention to the details is what makes SQL Database Studio (SDS) perfect. 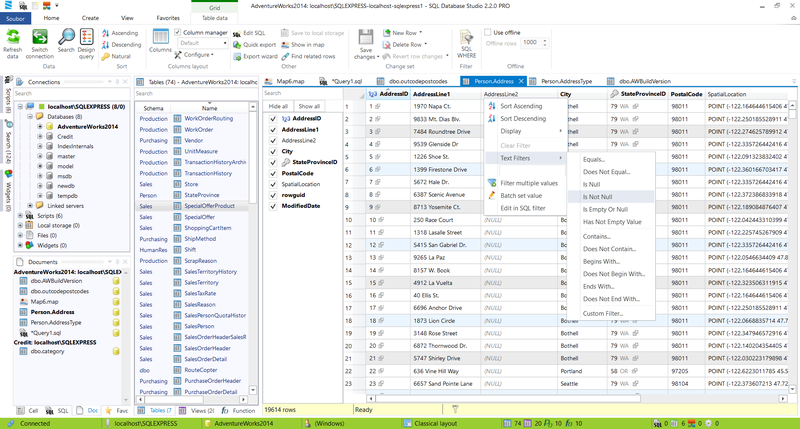 SDS automates repetitive tasks such as filtering, sorting, searching and much more. You can stay focused on problem you are solving and be more productive. 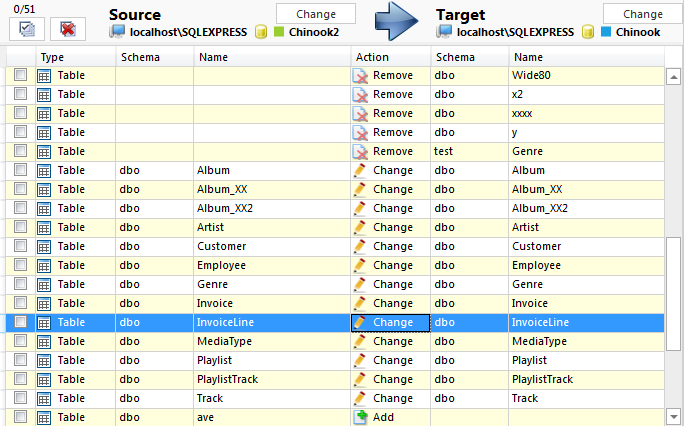 In SQL Database Studio you can quickly make yourself at home, with customizable layout schemes for different purposes. Work with your preferred style. The IDE understands your needs and helps you produce high-quality work more efficiently, thanks to intelligent code completion, powerful navigation, table lookups, diagrams designers, widgets and switching from one database project to another with a breeze. Visualise points, polygons, and lines on map. Use Open Street Map, Goole Maps, Bing maps and more than 50 other popular map providers. Export map with markers from database to WEB page. Collect useful scripts related to one table as data widgets. You can define custom widget. Its SQL command is dependend on variable @value. Displayed database structure is always up-to-date so there is no need to refresh database structure and all operations are extremely fast. Quick search between tables, view, procedures, functions and columns. Generate SQL scripts from database objects. Design SELECT, UPDATE, DELET and INSERT queries. Use data preview of analysing of query result. Create quickly advanced queries with WHERE (NOT) EXISTS and CROSS/OUTER APPLY join operators. Import and export to various formats - CSV, HTML, TXT, MS Excel. Export data from query, multiple tables or views. Save and edit job. Use local storage as intermediate storage of your table data. Compare database models on different SQL servers. Browse differences or selective synchronize models. If you'd like to get in touch with us, email us.